Writing an entire novel in one month is a daunting idea. Overwhelming, really. Maybe that’s why I haven’t ever completed it. 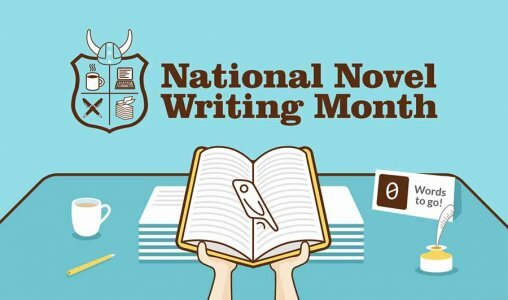 But I think what I often forget about when considering taking on the NaNoWriMo challenge is that the process doesn’t really start on November 1st. Trying to start writing a novel on 11/1 with a blank page and no prep work is going to make NaNoWriMo a scary, scary time. Which is why I’m writing this blog on October 1st, not next month. Writers need time to PREPARE before they can start writing. Having your plot outline, character overviews, setting and style figured out will make the actual writing process that much more streamlined. So that’s my focus right now – getting ready to write next month! Writing Classes: I have been an online student of Coursera for several years now. The classes are very accessible, and while they do charge students who wish to take the course for a certificate, you can also “audit” any class for FREE. The only thing you won’t get is a grade, but you can still participate in the lessons and do the assignments. Learning costs nothing! So I enrolled in a few courses from the Wesleyan University Creative Writing Specialization to help me stay on track for my NaNoWriMo project next month. Having a refresher on the fundamentals is always a good thing. Writing Resources: There are TONS of free online resources, writing groups and forums to join for ideas, inspiration and collaboration. My latest find is Eva Deverell’s website, which features a wealth of exercises and ideas available online to help you get organized. She made a TON of worksheets that you can download for free! Writing Exercises: If that wasn’t enough writing exercises, I must also recommend Novlr.org. I’ll be honest and say that I paid for a lifetime account a few years back, so I don’t know if this is exclusive for paid subscribers, but Novlr recently rolled out a Novlr Writing Course that I’ve been dying to try out. As a side note, if you aren’t familiar with Novlr, it’s a great service for writers. It’s a website that works both off and online and gives each of your writing projects a designated space with it’s own area for notes and outlines. It makes writing a story a lot easier! Tarot for Writers: I purchased the book “Tarot for Writers” a few months ago when I first was learning to read tarot. This book explains ways to use tarot cards for picking a setting, character development, even coming up with a plot line. Many writers often cite the “Fool’s Journey” as a writing template, which is a story arc that is made up of all the Major Arcana cards from a tarot deck in order. My goal for NaNoWriMo is to write my entire novella based on tarot card pulls. I think it’ll be fun to come up with a story using the magick of tarot! I tried this once before and it was actually kind of amazing how the cards I pulled worked perfectly for the story I was working on at the time. And since I don’t have some BIG IDEA to write about for NaNoWriMo, this will be an easy way to get going fast. Now my plan is to complete the writing courses I mentioned above during the month of October, as well as create some characters and a basic plot outline based on tarot cards. Then in November… it’s novel writing time!